September 10, 2009, NEW YORK, NY. 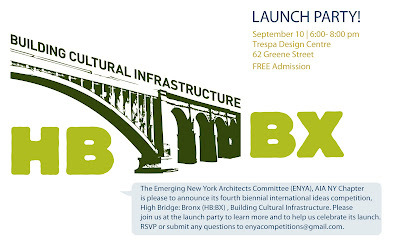 The Emerging New York Architects Committee (ENYA), AIA New York Chapter, is pleased to announce its fourth biennial international ideas competition, High Bridge: Bronx, Building Cultural Infrastructure (HB:BX). Please join us at the Trespa Design Centre in SoHo, September 10 at 6:00 pm to help us celebrate its launch. This competition is open to all emerging professionals, including, but not limited to, architects, artists, engineers, landscape architects, urban designers, and planners who have completed their education at the undergraduate or graduate level within 10 years of the competition announcement (September 10, 2009). The registration deadline is November 18, 2009, and the submission deadline is January 18, 2010. An online gallery will feature all submitted design entries. In addition, cash prizes and inclusion in an exhibition and publication will be awarded to the winning designs. HB:BX is an open ideas competition to design an arts center that culturally reinforces the physical connection between the Manhattan and Bronx High Bridge communities of New York City. Working in cooperation with the arts organizations Artists Unite and the Bronx Museum of the Arts, ENYA means to draw awareness to the current efforts to restore and reopen the historic High Bridge. This competition is a forum to explore the urban and community improvement opportunities that may come with the achievement of such a momentous milestone. Thus, ENYA challenges designers to explore how disused structures can be reprogrammed into elements of a vibrant urban cultural center. Entrants are also challenged to rethink the relationship between existing infrastructure (aqueduct, railway, highway) and the contemporary urban context. These issues, universally relevant to any growing city, take on a more site-specific nature when considering the importance of the High Bridge and the topographic challenges posed by the steep riverbanks of the Harlem River. Also defining this competition are the unique clients who ask entrants to reconsider architecture’s role in the creation, display, and experience of viewing art in one of the world's most culturally vibrant cities. Be sure and submit an entry ... you still have time! It is really all about who is going green.